The Enigmatic shapes looks like nautilus family. Enigmatic Hanging Lighs by JUHI ARTZ are not only crowd pullers but also the best sellers at all exhibitions including the Trade Fair at Pragati Maidan. The enigmatic shapes captivates people from all walks of life. These shapes come in different variations (small medium and large) and orientations (horizontal and vertical). 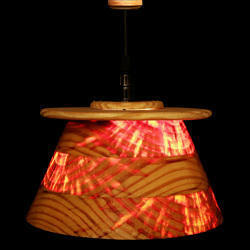 TheseThis handcrafted enigmatic flower made from pine wood appears to be an amazing and unique mosaic pattern and when energized with LED warm white emits intriguing combination of red, yellow, brown and black colours. A real treat to the eye to watch the transformation physically. Each piece is treated separately - cutting, sanding, polishing followed by assembling. Leveraging by the vast experience of this domain, we manufacture and supply the best quality of Pinewood hanging Lights. Designed in accordance to the latest fashion trends, the rendered wooden decorative oval lamp is known for its alluring appearance. By following total quality assurance procedures, we assure that the quality of the rendered wooden decorative Hanging Lights is never compromised.